Resort guests ages 7 and older master various techniques to glide through the resort’s pools with the help of a specifically designed, colorful tail and fin. For adults – “Mermen” included – the 60-minute program provides an excellent alternative core workout, combining synchronized and monofin swimming. Classes are offered at $70 per person every Friday at 4 p.m. and 5 p.m.; and every Saturday and Sunday at 9 a.m. and 10 a.m., now through September 5, 2016. Reservations are required and can be made by calling the resort concierge at (480) 423-2572. This program is available to resort guests only. Family members of all ages will be entertained while solving puzzles and playing games to track down iconic locations throughout The Phoenician. A complimentary iPad is available through the resort concierge at (480) 423-2572. This activity is available to resort guests only. Purchase one treatment and receive a second treatment of equal or lesser value for 50 percent off. Services must take place on the same day and can be shared. Relax with a friend, or plan a mother/daughter escape. For more information and to make reservations, visit http://www.thephoenician.com/spa or call (480) 423-2452. This offer is available to resort guests and the general public from June 1-October 31, 2016. From June 1-September 15, 2016, three Phoenician restaurants will offer select multi-course menus at exceptional prices. Savor a $40, three-course menu at J&G Steakhouse; a $30, three-course Afternoon Tea menu (Monday-Friday) and a $20, two-course menu at Relish Burger Bistro. For details and reservations, visit http://www.thephoenician.com/culinary-offerings and call (480) 423-2530. This offer is available to resort guests and the general public. Memorial Day Weekend kicks things off with a Surf’s Up! Beach Party featuring a sidewalk chalk art competition, along with sand-castle building, on Saturday, May 28. With a variety of military vehicles on display, guests will have the opportunity to write letters and prepare care packages to send to U.S. servicemen and women overseas on Sunday, May 29. IGNITE at The Phoenician lights up the Independence Day Weekend with an indoor carnival followed by fireworks on Saturday, July 2. A spectacular pyrotechnics show will also be presented by the Arizona Skyhawks Parachute Team. These offerings are available to resort guests only. For more information and to make room reservations, please call (800) 888-8234 and mention rate plan SUMMER, or visit http://www.thephoenician.com/offers. 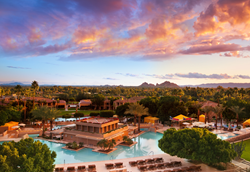 Located at the base of Camelback Mountain, the 250-acre Phoenician offers two exquisite experiences – a 583-room AAA Five Diamond luxury resort hotel and Arizona’s renowned Forbes Five Star and AAA Five Diamond boutique hotel, The Canyon Suites -- at one magnificent destination. The property features elegant, residential-style accommodations, distinctive and delectable cuisine across such restaurants as Il Terrazzo, J&G Steakhouse and Relish Burger Bistro, a 27-hole golf course, 10 tennis courts, eight swimming pools, The Centre for Well-Being and Salon Mila spa complex, an activities program for all ages and interests, numerous boutique shops, and a multi-million dollar art collection. In addition to these offerings, the stylish 60-room Canyon Suites provides more intimate surroundings and enhanced services, including a private infinity pool, complimentary daily wine tastings, hypoallergenic rooms, and an enhanced pet-friendly program with a canine room service menu. Both The Phoenician and The Canyon Suites are owned by Host Hotels and Resorts, Inc., and operated by Starwood Hotels & Resorts Worldwide, Inc., as part of The Luxury Collection. For additional information, please call (480) 941-8200; (800) 888-8234 or visit http://www.thephoenician.com and http://www.canyonsuites.com.